I was going to post a pasta dish this week – it’s really good and summery but still creamy and light – but I just couldn’t bring myself to suggest that you turn on both your oven and your stove. I don’t know about you, but we are in the middle of a heat wave. It’s another heat wave, or maybe it’s the heat wave we’ve kind of been having all summer despite a couple days last week. We have established a system of closing our windows around noon when it starts to get really hot outside, turning on the air conditioning when the inside temperature gets unbearable, and then opening the windows in the evening once the outside temperature is lower than inside or maybe if there’s a slight cool breeze blowing by. On days like this, I can’t imagine eating anything hot. In fact, I would prefer that everything I ate was cold and crunchy, preferably also maybe juicy or with a little tang or spice to it. These toasts almost fit that bill – no juiciness really (unless you include the cucumbers that I GREW IN MY OWN GARDEN – sorry, I’m excited), but lots of crunch from the sliced vegetables and tang from the miso cream cheese. You do have to turn on your toaster, but it’s worth it, I promise. OK people – I know we read a lot of food books and talk about them all the time, but if there is ONE book you are going to read from our suggestions, let it be An Everlasting Meal by Tamar Adler. It is amazing book that changed my life, and is sure to make you think and act differently around food. If you have not read it yet, go read our blog post on her book, and then continue below. This beet tart is a perfect example of Tamar’s philosophy and grace: if you attacked this beet tart recipe from start to finish in one cooking session alone – it would take most of your day; first you would have to roast the beets (which takes a long time anyway), then make tart dough and chill it for an hour, then bake the tart dough, then put together the filling, bake some more, add the sliced beets, and bake once again. Sounds daunting! I would never have done this recipe if it wasn’t spread out over many days and incorporated in the general meal preparations for the week. However, the manner in which it was made made it feel like I was just throwing leftovers together in a very creative way, rather than a labor intensive ordeal. Here’s what happened: A few days before, Annie and I roasted a whole bunch of veggies for dinner (or was it lunch?). We filled the whole oven and roasted lots of different veggies with olive oil and salt. I fit the beets in a small pan with a 1/2 inch of water in the bottom, covered them with foil, and let them roast for a long time (probably too long, I may have forgotten about them). We ate the other roasted veggies as part of our dinner that night, but we had no intention of eating the beets that day, so we didn’t have to wait around for them to roast. We let them cool and then peeled them and put them in the fridge before bed. Now we had roasted beets peeled beets in the fridge. We had no plan but we had ideas: beet salad, beet pasta, or beet anything; they were simply a nice starting point. A few days before roasting the veggies, we had made a different veggie tart using the Olive Oil Tart dough recipe that can be found in Tamar’s book, so we had some leftover in the fridge. 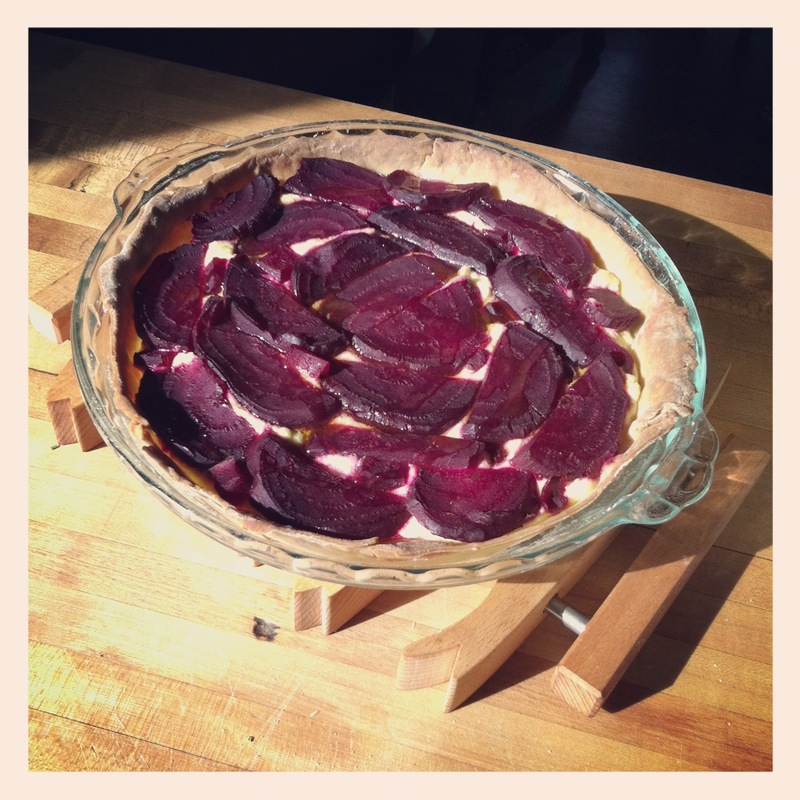 A few days later, I looked in the fridge and saw that a perfect storm had brewed for a beet tart. There, sitting in the fridge waiting to be used, were roasted peeled beets, tart dough, and some leftover ricotta cheese. If you want to make this recipe from start to finish, more power to you. However, I would suggest at least making the tart dough a day ahead, and then looking through your fridge to find any vegetables that would work, roast them, and put them on top of the tart in place of beets. Note: You’ll want to roast your beets or other vegetables before you make the tart dough. Mix all ingredients together in a bowl. If its too dry, add more water, a tablespoon at a time. Divide the dough in half and roll into balls, then put them in the fridge to chill. Take out one dough ball (you get to save the rest for another day!) and roll it out on a floured counter until its about 1/4 inch thick. Heat the oven to 400 degrees. Grease the bottom of a 9-inch pie pan and dust with a bit of flour. Lay the crust in the pan and trim the edges. Prick the bottom a few times (this dissuades bubbles from appearing in your tart dough). Cover the crust in aluminum foil and put some dried beans or pie weights in to fill the tart and hold down the dough. Bake for 20 minutes. Whisk together filling ingredients. Pour into the pre-baked tart dough (remember to take out the dried beans and aluminum foil!) and bake at 400 degrees for 15 minutes. Now lay your beet slices (I cut mine into half-moons) on top of the ricotta filling in a single layer and bake for another 10 minutes. Let it cool and eat at room temperature. It is very filling and great for lunch the next day and many days after!